MASKerade: Shakin' just for fun! Here's a card I made for our niece's birthday. One thing about a shaker card - no one can resist picking it up and giving it a shake! 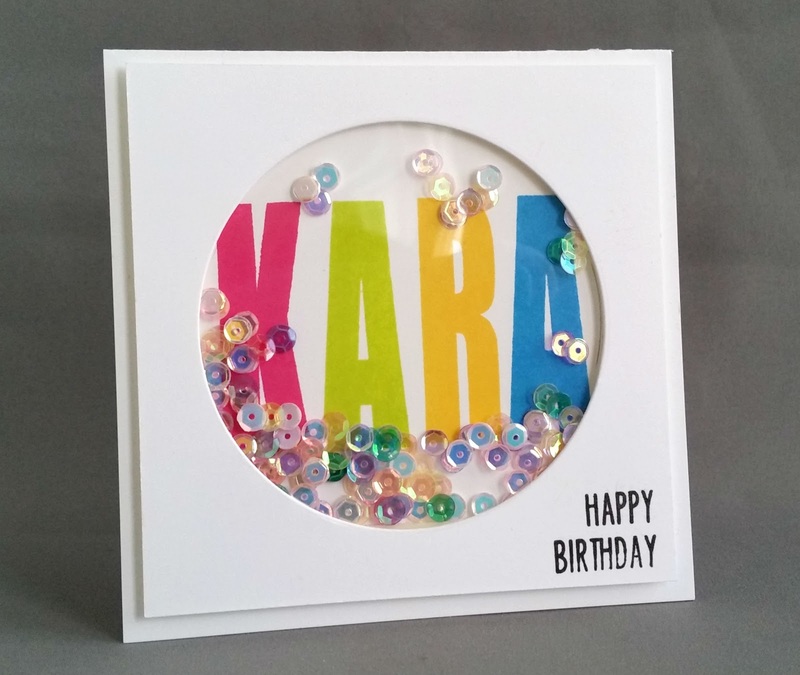 I kept it quite simple, focusing on her name (spelled with My Stamp Box Tall Solids Alpha in some of my favourite colours!). I stamped the happy birthday after I put the card together, which was a bit of a mistake - you can see that the bottom half of 'birthday' was not as well supported by foam tape as the rest of the stamp. I always have to learn these things the hard way! Hmm, that happens to me all the time... I never seem to learn! Love this shaker... looks fab with the name stamped in the BG ! Love your card Ardyth! The colors are awesome...and I can't tell you how many times I've done that with the sentiment at the last minute! This is a super fun shaker card, Ardyth! Looks as if we've all learned the hard way, Ardyth! LOve that card, WOW do I love the alphas!! Fun and festive shaker card Ardyth! Your niece will love it, anyone loves a shaker. Would have never noticed the inking but have made that mistake myself too many times before. Hey Ardyth,I love all your cards. So beautiful. You should do videos for those of us learning. Thanks for sharing your cards. What a super fun idea. Darling card! Another superbly CAS and inspirational card Ardyth!!!! You creations never cease to amaze! Your niece is going to LOVE this! Love the rainbow alphas. Wonderful shaker card. And, no one is going to see your little mis-stamp. Too overwhelming to see all those fabulous large rainbow letters and all those cute shaking sequins. This is so cute and happy! Your niece will love it!